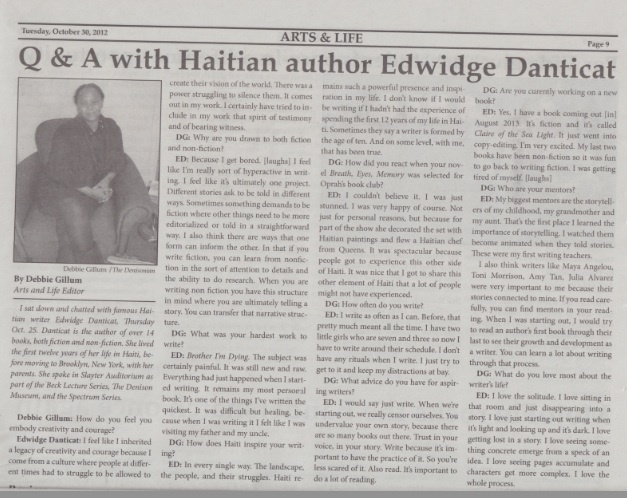 I sat down and chatted with famous Haitian author, Edwidge Danticat, Thursday Oct. 25. Danticat is the author of over 14 books that are both fiction and non-fiction. She lived the first twelve years of her life in Haiti, before moving to America with her parents. She spoke in Slayter Auditorium as part of the Beck Lecture Series, The Denison Museum, and the Spectrum Series. Debbbie Gillum: How do you feel you embody creativity and courage? Edwidge Danticat: I feel like I inherited a legacy of creativity and courage because I come from a culture where people at different times had to struggle to be allowed to create their vision of the world. There was a power struggling to silence them. It comes out in my work. I certainly have tried to include in my work that spirit of testimony and of bearing witness. DG: Why are you drawn to both fiction and non-fiction? ED: Because I get bored. [laughs] I feel like I’m really sort of hyper active in writing. I feel like it’s ultimately one project. Different stories ask to be told in different ways. Sometimes something demands to be fiction where other things need to be more editorialized or told in a straightforward way. I also think there are ways that one form can inform the other. In that if you write fiction, you can learn from nonfiction in the sort of attention to details and the ability to do research. When you are writing non fiction you have this structure in mind where you are ultimately telling a story. You can transfer that narrative structure. DG: What was your hardest work to write? ED: Brother I’m Dying. The subject was certainly painful. It was still new and raw. Everything had just happened when I started writing. It remains my most personal book. It’s one of the things I’ve written the quickest. It was difficult but healing because when I was writing it I felt like I was visiting my father and my uncle. DG: How does Haiti inspire your writing? ED: In every single way. The landscape, the people, and their struggles. Haiti remains such a powerful presence and inspiration in my life. I don’t know if I would be writing if I hadn’t had the experience of spending the first 12 years of my life in Haiti. Sometimes they say a writer is formed by the age of ten. And on some level, with me, that has been true. DG: How did you react when your novel “Breath, Eyes, Memory” was selected for Oprah’s book club? ED: I couldn’t believe it. I was just stunned. I was very happy of course. Not just for personal reasons, but because for part of the show she decorated the set with Haitian paintings and flew a Haitian chef from Queens. It was spectacular because people got to experience this other side of Haiti. It was nice that I got to share this other element of Haiti that a lot of people might not have experienced. DG: How often do you write? ED: I write as often as I can. Before, that pretty much meant all the time. I have two little girls who are seven and three so now I have to write around their schedule. I don’t have any rituals when I write. I just try to get to it and keep my distractions at bay. DG: What advice do you have for aspiring writers? ED: I would say just write. When we’re starting out, we really censor yourself. You undervalue your own story, because there are so many books out there. Trust in your voice, in your story. Write because it’s important to have the practice of it. So you’re less scared of it. Also read. It’s important to do a lot of reading. DG: Are you currently working on a new book? DG: Who are your mentors? ED: My biggest mentors are the storytellers of my childhood. My grandmother and my aunt. That’s the first place I learned the importance of storytelling. I watched them become animated when they told stories. These were my first writing teachers. I also think writers like Maya Angelou, Toni Morrison, Amy Tan, Julia Alvarez were very important to me because their stories connected to mine. If you read carefully you can find mentors in your reading. When I was starting out, I would try to read an author’s first book through their last to see their growth and development as a writer. You can learn a lot about writing through that process. DG: What do you love most about the writer’s life? ED: I love the solitude. I love sitting in that room and just disappearing into a story. I love just starting out writing when it’s light and looking up and it’s dark. I love getting lost in a story. I love seeing something concrete emerge from a speck of an idea. I love seeing pages accumulate and characters get more complex. I love the whole process. Haitian author, Edwidge Danticat, came to Denison Thurs. Oct. 25 and spoke to students and faculty about her own creative and courageous storytelling. The lecture was sponsored by The Denison Museum, The Spectrum Series, and the Beck Lecture Series. Danticat is the author of Brother I’m Dying, The Farming of Bones, Create Dangerously: The Immigrant Artist at Work and Krick? Krak!. After the audience was asked to move forward, to create a more intimate environment within the large Slayter auditorium, Diana Mafe, an English professor introduced Danticat. She noted how the storytellers of her childhood, such as her mother and her aunt, were her role models growing up. “My real life storytellers told stories through gestures, images, and words” she said. She told a heartfelt story of a close friend realizing he wanted to be a photojournalist in 1964, when he was just 13, after he witnessed a public execution in Haiti. The two men were executed by a firing squad and after they were taken away, he picked up a pair of eyeglasses that the prisoner had been wearing. “He noticed tiny chunks of brain splattered on the cracked lenses.” Danticat said. The execution changed everything, Danticat said. This experience inspired him to become a photojournalist, he told Danticat when they were in Miami, forty years later. One of the things that she learned from writing her newest book, Create Dangerously, is that no story is ours alone. To tell a fuller story, we must tell many stories, she said. She also explained how telling stories is not always easy. “Sometimes we can’t tell our own story and that’s when we need courageous storytellers.” Danticat said. She explained how we need people to step in and tell these important stories for us. Danticat cited a Haitian proverb that says, “Words have wings. Words have feet.” Meaning, words can travel further than we can and stories have the power to enlighten and uncover in a way that we never could. After her reading, she opened it up to questions from the audience. English associate professor Dennis Read told her that his class had read her memoir Brother I’m Dying and wanted to know whether she would have written the book if she had not been pregnant with her first child. She answered, “I did feel compelled. I wanted to have a record for my daughter.” She said that if she hadn’t been pregnant then it would’ve been a book about her uncle and her father, and less about herself. Writing the memoir also helped her cope with the grief of losing her father and uncle. Kerstin Liedtke, an exchange student from Germany, really liked Danticat’s talk. “It was so interesting to see her perspective and get an insider’s look” she said. To celebrate Danticat’s visit to Granville, Whit’s offered a special flavor called Heavenly Haiti. It was banana custard with coconut and dark chocolate flakes. All of the proceeds went to support Healing Art Missions. Danticat’s talk was overall very inspiring to the Denison community by encouraging young writers to not be afraid to tell stories and to realize the power of stories.